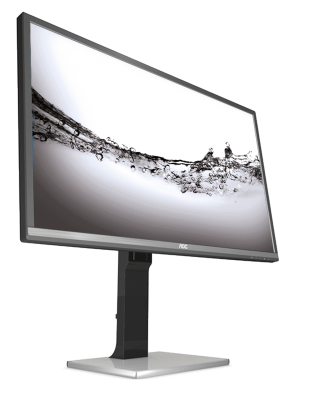 Display specialist AOC presents a new high-end monitor that brings 4K into a more compact format to fit on any desk at home or in offices. The AOC U2477PWQ’s space-saving 23.6″ (59.9 cm) 4K display provides the user with an impressive UHD resolution of 3840 x 2160 pixels. Its PLS panel delivers the best colour uniformity at any viewing angle and exploits 100 % of the sRGB colour gamut. Ultra-fast HDMI 2.0 ensures a bandwidth up to 18 Gb/s, which allows a fluid playback of 4K videos, e.g. when connected to a 4K Blu-ray player, 4K camcorder or 4K gaming. The monitor comes in a premium timeless design: With its textured and transparent base, the monitor is an eye-catching companion for professional work and ambitious home users. Many users have become accustomed to displays with high pixel densities, for example on their smartphones, so they do not want to forego this image quality on their monitor screens, too. However, most 4K displays pack the imposing 4K resolution of 3840 x 2160 pixels into large monitor sizes which do not necessarily fit into smaller offices. The new AOC U2477PWQ offers a compact solution for everyone: With its display size of 23.6″ the monitor is an ideal option for users who look for a 4K solution but do not have a big office or desk. What is more, with the new Windows 10 operating system, detecting and setting up 4K resolutions has become far more intuitive, making the use of 4K much easier with monitors of all sizes and formats. The combination of a 4K resolution with a compact screen size entails an extra high pixel density, which leads to ultra-sharp images and a crystal clear reproduction of photos and 4K videos. Users do not have to scroll or down scale their images anymore to see the whole picture and at the same time enjoy the smallest details. The PLS panel delivers a vivid as well as very precise colour reproduction and comes with wide viewing angles of 178°/178° – horizontal and vertical. PLS panels have an extremely good colour uniformity at any viewing angle. The 8-bit colour support and sRGB colour gamut rounds off the high performance of this display. This way, the U2477PWQ offers the user vibrant pictures, making it ideal for professional users like graphic designers, photographers and movie makers who prefer a smaller display size. Also, ambitious home users find a convincing solution for private photo and video editing. And even if those tasks require long-time work, the display offers a helpful technology to prevent the user from eye fatigue: Flicker FREE helps to reduce imperceptible, but eye-affecting flickering. The stylish design of the monitor makes it a true eye-catcher in every workplace. With its textured finish and transparent stand, the display combines timelessness and modern understatement. Various ergonomic options complete the performance: Users can adjust the height, and use the tilt or pivot function to find the ideal setting for a healthy posture. And the monitor is very well equipped with advanced connectors, too. In addition to the ultra-fast HDMI 2.0 input that increases the bandwidth significantly up to 18 Gb/s and allows for 60 fps 4K video playback MHL 3.0 and DisplayPort 1.2 are also on board. MHL allows users to display content from a smartphone or tablet while charging it at the same time.